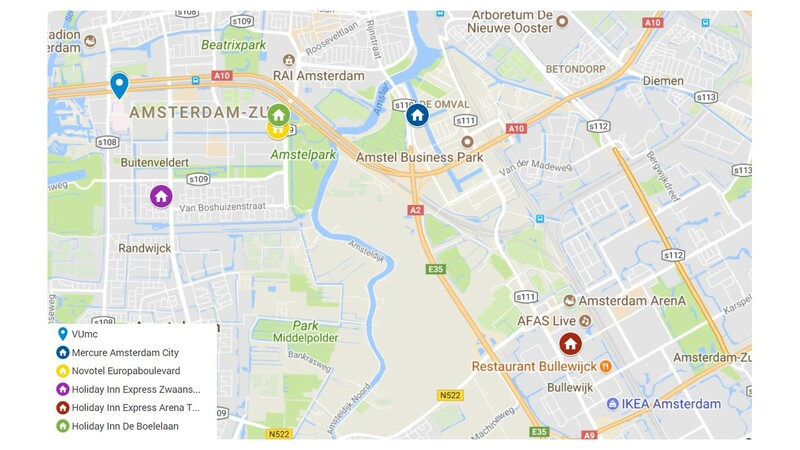 If you would like us to take care of your hotel booking, you can book your Amsterdam accommodation by clicking the button below. All rates indicated are for one standard room for one night, including breakfast, Wifi, the local tax of 6% per person per night and applicable VAT (incl 2,73% non-deductable BE VAT). Rooms will be assigned on first come, first serve basis. The PCO cannot give a guarantee on the type of room that will be assigned. To avoid disappointment, it is strongly recommended to book hotel reservation early. The deadline for your hotel booking is February 15th 2018. Please note that the hotel rooms offered are only available during the following period: from May 30th until June 3rd 2018. Most hotels offer Double rooms in Single Use, Double rooms in Double Use and Twin rooms in Double Use. Room rates differ based on hotel selection and room type. Please don't hesitate to contact us via rims@seauton-international.com in case you have any questions or remarks. Each hotel reservation has to be linked to a registration for the Conference, except for the person guiding a Group (Group Guide). In the event hotel reservations are made not being part of a registration for the Conference, the Conference Secretariat has the right to cancel the hotel reservation. Holiday Inn Express Amsterdam Arena Towers is located in the centre of Amsterdam Southeast, the most dynamic entertainment area of that part of Amsterdam. Each room at Holiday Inn Express Amsterdam Arena Towers features a modern decor, an LCD TV, box-spring beds and a bathroom with a walk-in shower. Other amenities include a work desk and a tea/coffeemaker. Light hotel rooms with free WiFi. Guests can enjoy the on-site lounge bar, restaurant and fitness centre. Situated in Amsterdam’s business district, this Holiday Inn Express offers modern rooms with free WiFi. Rooms include an LCD TV with satellite channels, a pillow menu, a work desk and a tea/coffee maker. All have a private bathroom that features a walk-in shower. Mercure Hotel Amsterdam City is a 4-star hotel located at the Amstel river, located at a 10-minute drive from the Conference Venue. Spacious rooms with free WiFi, flat-screen TVs and a bathroom with bath or shower. Sauna and Turkish steam bath facilities.